Thames & Hudson, 9780500294130, 288pp. Inspired by the complexity and heterogeneity of the world around us, and by the rise of new technologies and their associated behavior, The Architecture Concept Book seeks to stimulate young architects and students to think outside of what is often a rather conservative and self-perpetuating professional domain and to be influenced by everything around them. Organized thematically, the book explores thirty-five architectural concepts, which cover wide-ranging topics not always typically included in the study of architecture. 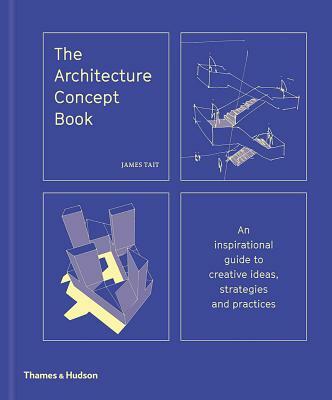 James Tait traces the connections between concepts such as familiarity, control, and memory and basic architectural components such as the entrance, arch, columns, and services, to social phenomena such as gathering and reveling, before concluding with texts on shelter, relaxing, and working. Even in a digital age, Tait insists that "we must always think before we design. We must always have a reason to build." Each theme is accompanied by photographs, plans, and illustrations specifically drawn by the author to explain spatial ideas, form small scale to the urban.